Passion, ambition, and treachery collide in this compelling drama about the early years of King Henry VIII's infamous 40-year reign. 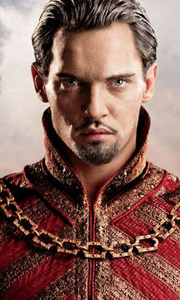 With a lust for power and an appetite for love, this young Monarch (Jonathan Rhys-Meyers) rules his kingdom as he lives his life - with ruthless abandon. Affairs of the state carry little interest for him, and official matters are left to the powerful Cardinal Thomas Wolsey (Sam Neill), while England's rul..
Golden Globe Award-winning Jonathan Rhys Meyers gives the performance of a lifetime as England’s most notorious king in the thrilling hit drama series, The Tudors. King Henry VIII’s fierce passion to secure England’s world prominence and his own legacy leads him through a string of six wives, an ill-advised war with France, and ultimately a place in history as one of the world’s most charismatic, most brutal, and most deeply human kings.. When a man leaves his wife for another woman, passion flares and anger erupts. But when the man is a King, his dalliances threaten the future of his whole kingdom. Welcome to the world of The Tudors, the critically acclaimed drama that breathes new life into England's sexiest, most savage reign. As Henry VIII (Golden Globe winner Jonathan Rhys Meyers) eagerly pursues seductive Anne Boleyn (Natalie Dormer), rival forces, including Sir Th.. Passion, obsession and a lust for power ignite in this remarkable third season of the critically acclaimed hit series The Tudors, starring Jonathan Rhys Meyers, Joss Stone in her acting debut and Max von Sydow. Twenty-seven years into his reign, King Henry VIII is at the height of his powers. A new Queen means revived hope for an heir, and the growth of his Protestant Reformation promises that Henry will be the most influential religiou..
Golden Globe Award-winning Jonathan Rhys Meyers gives the performance of a lifetime as England's most notorious king in the thrilling hit drama series, The Tudors. King Henry VIII's fierce passion to secure England's world prominence and his own legacy leads him through a string of six wives, an ill-advised war with France, and ultimately a place in history as one of the world's most charismatic, most brutal, and most deeply human kings..